Club Penguin Wiki:Party Ratings/2015/Puffle Party - Club Penguin Wiki - the free, editable encyclopedia about Club Penguin's games, rooms, items and parties! You are on the party reviews page for the SoundStudio Party. Ratings for this even are now closed. However, you are free to join us on our wiki chat by clicking here! This party sounded amazing when they announced what it was gonna be about, so let's see if it is as pufftastic as I wished by weighing the pros and cons. The quest was FUN, and didn't make you wait a day to continue. There were lots of small cameos from other mascots at the party, which rarely happens nowadays which is nice. While I didn't mind that the rooms were reused from last year, I was disappointed that they kept the Forest (which was meant for Earth Day. and Earth Day doesn't happen in March) as well as the Snow Forts (which CLEARLY advertised the Cat and Dog Puffles, which came out last year as well). Conclusion With 5 more pros than cons, I have no choice but to give this amazing party 5/5! I am not surprised either, as I truly, truly loved this party. It may even be in my top 5 favourite parties OF ALL TIME in CP! Somehow, CP managed to get me hyped for this party. However this time, it wasn't a TOTAL letdown... I think. First, party features. The quest isn't too bad, and it's cool how each item has a different effect, and it's not just "Oops that won't work" every time. It made me want to try every item! The "Wilds" are kind of disappointing though, there's only four rooms. What happened to the wilderness during Operation: Puffle or the Wilderness Expedition? There also weren't any "come back tomorrow" or "come back in two days" shenanigans and you could adopt every puffle from the start. Speaking of adopting puffles, all the puffles from Puffle Wild are available online now, which is nice because people who don't have "iStuff" can get them now, and who knows how long it would've taken to get the app on Android... Unfortunately, the puffle transformations are gone which is disappointing, but oh well. The music was TERRIBLE. It was mostly new, boring tracks (or maybe they were recycled from last year, I don't really remember anymore) with some Muppets songs for some reason. There's a few older songs like from the Winter Luau, Norman Swarm, and the old Puffle Parties, and those are the only good ones. The items are okay, but I really can't see myself ever using them. So yeah, the Puffle Party is a lot better than other parties, but still has a lot of flaws. .5 stars for music, 1 star for quest. The new ski lodge and attic look nice. Most of the decorated rooms were nice and they weren't not totally overhauled. Most of the rooms were re-used from the Puffle Party 2014 and a couple didn't really fit in with this years Puffle Party (Snow Forts & Dock). However, I don't mind this. The return of the Puffle Gala seemed pointless. The expedition was quite fun and we didn't have to wait a day to do another part of it. It did take longer to complete. However, it would have been better if the things we were supposed to find were less outlined to make finding them harder. There wasn't the best replay value as we couldn't earn any coins if you replayed the expedition. I love the puffle creature hoodies and hats. Most of the music was great. It fit in with the rooms well. I disliked how non-decorated rooms were given Puffle Party music. I liked the remixed music at the Stage. The storyline was good. PH wanted to renovate the outdated Ski Lodge and then host a party after the completion. The party was ruined as someone or something had stolen the fishcake. Players had to find out who or what it was by venturing into the wilds. They find out which foods the Puffle creatures like and then find out that the Sasquatch took the fish cake. It still hasn't been explained clearly who the Sasquatch is which is good. The CP team can tell more of his story at future parties. I love how the CP times explained how Sasquatch got the Beta hat. PH had returned and she's the perfect mascot for the Puffle Party. It was great to see her waddling around the party. It was good to see other mascots make a minor appearance for the party. I don't see how Rockhopper managed to get back without his ship though. The party emotes fit the theme of the party nicely. I love the Tabby cat puffle emote. The party isn't perfect, but every single detail in it is good. 4 new puffles from Puffle Wild! What happened to the puffle rooms? This party is quite good, probably the best of 2015 so far. So how did it do? The decorations are quite good, but most are directly reused from last years party. The Town and Plaza's decorations have been used since 2012 so marks are deducted here. However marks are gained for the Cove's design, the water slides are great fun! Several rooms such as the Ski Hill, Beacon, Pet Shop, Iceberg and Underground lack decoration. The Dance Club, Pizza Parlor and Mine Shack lack decoration but have music. This feels a bit cheap, but the other decorations save the party in this area. 6 out of 10 points are awarded. The quest was very good! We have to explore the wilds and lure out puffle creatures with different o' berries. At the same time, we have to find out who stole the cake from the Ski Lodge. I found this was a good way to reveal the Sasquatch, who was apparently around since the Beta Test. It's also quite funny when you deliver the wrong items and mascots such as Rookie come out. I would have liked the wilds to be a bit bigger like in Operation: Puffle, but none the less it was still a great quest. The music was a mixed deal. On one hand the new music is quite good (except in the Dance Club and Puffle Gala). Classic songs returned such as the Cove (Winter Luau), Mine Shack (Puffle Ragtime) and Beach (Summer Party). However some songs were out of place such as Bretzel Bash (I think) at the Dock, the French music in the Pizza Parlor and the Fair music at the Stadium. I also can't stand the music in the new Ski Lodge and Attic. The wilds were quite good but felt a bit small. It would have been better if they were bigger and the quest was harder. None of the classic party rooms (Puffle Show, Night Club Rooftop etc.) returned, which would have made the party even better. PH suits the puffle party, but it is a bit expected or clichéd. The Sasquatch is revealed but not actually meetable (I think). It's funny how mascots such as Rookie and Gariweld appear when you bring certain items, but how does Rockhopper get here without his ship? While this party is good, it just doesn't touch previous puffle parties. The party is lacking the puffle zones, where each puffle got its own room. But most importantly I feel we have lost the whole point of the puffle party. The whole point is to care for and celebrate our puffles. But it feels like that we are neglecting our normal puffles and focusing on exploring the wilds and discovering puffle creatures. Therefore I have to deduct some marks in this section. This party also lacks decoration in rooms such as the Ski Hill, Beacon, Dance Club, Arcade, Pet Shop and Underground, rooms that were decorated in past puffle parties. This section deals with any other business. The emotes were quite good. I especially liked the Cat Puffle emote. I don't really like the re-design of the Ski Lodge and Lodge Attic, although they do have a few cool features such as the Box Dimension portal. I think it is good that the puffle creatures that were previously exclusive to Puffle Wild App users are now available to adopt in-game. This party was confirmed in January. A little too early, but not much was given away about the plot so this counters the former. Its nice that we will be able to visit some of the Wilds after the party ends. Ok with 35/50 I award the puffle party 3 and a half stars. See you in April for the Frozen Fever Party! -The music wasn't all that great. -I miss the classic puffle party with the puffle domains. Hello there, fellas! My name is Enb 11 and welcome to my first review of 2015! The Star Wars party and Soundstudio Party didn't get reviews from me because they were so poor and contentless, I didn't felt like it. Let's begin now my review for the Puffle Party 2015, a surprisingly fun party, even if for just a couple of minutes. Rooms and Music: Club Penguin puts a lot of effort in creating rooms that are absurdly similar to last year's party. Oh no, wait, they're the same. Yes, Club Penguin did the february thing again, and reused all party rooms from a previous party. The Snow Forts is overhauled and feels out of place, because it's focused on Cat and Dog puffles that no one even cares anymore. A total of 13 rooms were decorated, and although rehashed, they give a party feel to the island because it is spread out and not Town-Plaza centered like the previous party. Still, the upper rooms weren't decorated, like always. Now let's get to the actual place the party takes place. It begins in the Ski Village, in which a new portal takes place. It takes us to the wilderness (which looks strangely different from Operation Puffle but ehhhh, whatever. Consistency, amirite? ), that is very nicely made. The way the trees are arranged and nature elements give a nice touch, but the lighting the designers gave to it isn't very nice, because the rooms itself isn't that darkened. The new Lodge also falls into here because it was specially redesigned for this party, and it gained an party decoration weeks before the party, with a huge fishcake (more on that later). Also, the attic got filled with references and relics. Now music. The lodge's music is AWESOME. It's incredibly soothing, and differently from some rooms, it's not irritating at all. Could spend the whole day listening to it. It has a cool melody, and the use of country instruments is great. The Attic music is also cool. The Wilderness rooms have the same music vibe, an indigenous music mixed with nature sounds. That's about it for this topic. Content: My favorite part of the review. Differently from the dozens of parties before, this one didn't use the concept of come back tomorrow to win cool stuff. This party's quest is completed all in one day. Actually, ten minutes. But don't get me wrong, even though it's short, it's cool. Let's begin from the start shall we? This party has an actual storyline, something that was bothering many players from the community lately. It begins like this: PH has the idea to redesing the Lodge, transforming it in the Puffle Lodge, because of some awesome stuff she wants to do with Puffle Guides. She then throws a party with a large fishcake to innaugurate the new Lodge. We actually had a decoration with the fishcake so kudos to that. But, when the party starts something LARGE breaks the Lodge's wall and eats the cake! PH speculates that a giant puffle stole the cake. She then gives us a backpack in case we need to go on an expedition which is what we do. When you head into the wilderness there will be a large table. PH then says we need to find food to put on that table so that the fishcake stealer is attracted. Scattered across the other two wilderness rooms are various items that you can collect and put on the table, and CP doesn't give you a dummy manual and leaves you to find outwhich items will bring the stealer to light. But something more will be attracted. If you put a sandwich, stinky cheese, mug of coffee and a puffle statue, respectively a Rookie, Rockhopper, Gariwald, and PH messages will be triggered. If you put ice, pinecone, regular o'berry, and marshmellow, nothing will be attracted. But the surprise is here. If you put the differently colored berries on the table, the Puffle wild puffles will be attracted, you'll win a themed hat, and if a member you'll also get a hoodie, and the ability to adopt all colors of the Puffle Wild app puffles. But then PH suggests you get fish, and following her steps you do so. When you put the fish on the table, SURPRISE! Sasquatch appears, and he is the thief! A small comic will appear to tell the story of Sasquatch. He says he lives in the wild with the Wild Puffles, but they only eat the berries. It is not enough to fill his stomach, so when he sees the fishcake, he eats it so he can fill himself up. So, although short, this was a great quest/scavenger hunt. Club Penguin doesn't feed the instructions to us like we're babies, and as easy as it is, it doesn't consist only of throwing snowballs around in previously said places. Now, aside from this, there not much else to do in the party. They got a few cool rooms that provide roleplay value, but it's rare to see imaginative players nowadays. Last year's Merry Walrus Party (ugh) I actually had way more fun roleplaying in Santa's Workshop with a few anonymous buds than in the "party" itself. This shows that roleplay takes a big part in the parties, even if nowadays players are not so imaginative anymore. The party rewards us with 10 items, for finding the Wild Puffles and completing the quest. 5 of them are obtainable by non-Members. Players who didn't have access to an Apple product that could run Puffle Wild (like me) can now adopt all of the Puffle Wild puffles. Also, it seems like the party rooms will be PERMANENT, so yeah. We shall go now to the items. Items (and Puffles): As I previously said, there were 10 items in this party. They can be seen as 5, uhh, kits, I guess. Two items related to each wild puffle (hat and hoodie), and two Puffle Guide items which form a uniform. Non-Members have access to 5 of the 10 items, all of which are hats (way to go CP). The items are nicely designed, to me, perfectly representing the puffle they picture. As Easter arrives, the Bunny Hat is a favorite. I also like the Puffle Guide uniform (with hat). Players that want to dress up as scouts will surely find this useful. This is my review for the Puffle Party 2015! Hope ya all like this review, this is Enb 11, saying goodbye! It needs work, more areas, and MOAR PUFFLES. I know, I know, It's based off an app, but they could make some updates, maybe a "Puffle Wild: Part 2 Party" where things like Giraffe Puffles, Zebra Puffles and Lion Puffles are seen and PH goes into the wild again with a team of Puffle Guides, but find only 1 Orange Racoon Puffle with a thin tail that looked like a lion puffle. PH then goes out into Africa grasslands and finds tall Giraffe Puffles, White and Black zebra puffles but then finds white and Green (and Orange) striped Puffles and The lion Puffles can be heard roaring in the distance, a bit like the March 2013 Puffle Party in setup only a full animated short. Soon the bring them back to the Wild but then they go back to Africa's grasslands, so they bring them back and have an enclosure in the Pet Shop and only then they stay. Then we can adopt them and it can be happily ever after! So there is my story for what they should do and how they should do it! Not that much to say about this party, but it has a good storyline but lacks most of the past features from the past parties, especially the transformations and rooms. Our first satisfactory party of the year! Can you believe it? :D After months of me grading parties as Not satisfactory, we finally have a party with a Decent grade! The Puffle Party 2015 was successful on part of Club Penguin working with our feedback in consideration. This time around, the storyline actually made more sense after Club Penguin treated thoughtful development to it. It involved a subplot of the mystery of Sasquatch. We knew almost nothing about what Sasquatch was doing hanging around Club Penguin up until now. But now we got to learn more about the character as a result of this party. The fact that we still don't know that much about Sasquatch leaves layers of the character to still be unpeeled, and reels us in to see the character develop further. While Sasquatch's importance in the plot was well received, PH didn't have much memorable characterization. It was expected for her to be part of the storyline in the Puffle Party, but she did not bring any insight to the table, instead being more of a reporter telling you the facts. It was also pleasing to see that the storyline openly showed its effects on the island. We actually saw the damage done to the Puffle Lodge a week after the Puffle Lodge's revamp. This is reminiscent of the slower paced and developed storylines from the PSA/EPF eras, an ideal method for storytelling in Club Penguin. The gameplay had a quest style again, however, this was a step closer to better quests. Why? The challenge was set a bit higher because it was possible to get the wrong items. Like Chill57181 put it, "It made me want to try every item!" And like Riyita said in his review, "What really makes this fun is that you can only hold ONE thing at a time". 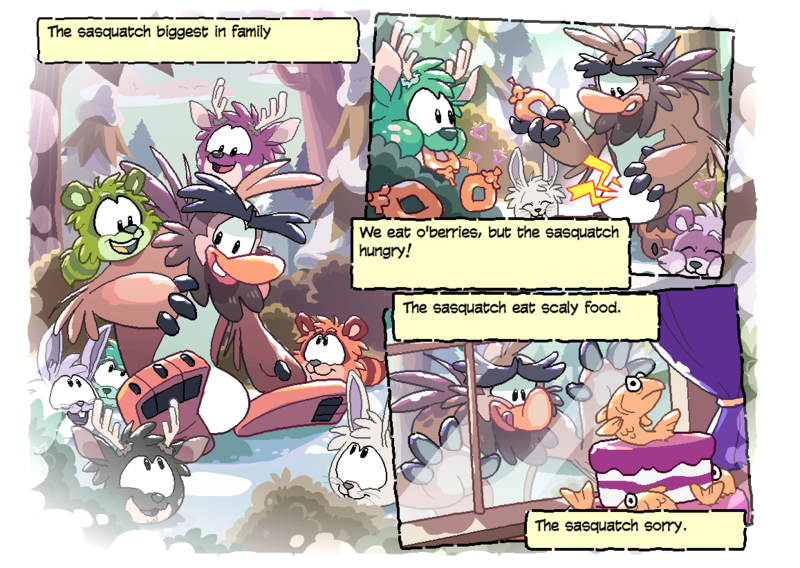 While it was unfortunate that there wasn't an explanation for how Rockhopper got back to the island, there was another issue I had with the quest, the dialogue by characters were in a visual novel style, which looked out of place for Club Penguin's MMO. Why not have in-game sprites of the characters like in Operation: Hot Sauce, or even better, cutscenes that make more sense with the plot? It doesn't make sense for PH to be talking to you in the Quest when she's not physically near you in-game. That just cuts the realism apart. How is she communicating? EPF Spy Phone? Clarity is important here. It was also quite confusing for the fishing rod part of the quest. When you catch a fish, there's no animation for the fishing rod catching the fish which unfortunately reduces the immersion of the quest. Did I mention that you can't use your own personal fishing rod item as an alternative? While enticing the Wild Puffles by using their favorite berries was interesting, the Wild Puffles, just like the Blue Crystal Puffles, may seem distinctive in promotional pictures, but the reality is that the only difference is how they look. The original Puffles had their own personalities and the Wild Puffles don't really differentiate or show much new traits or abilities. However, Sasquatch's friendship with the Wild Puffles contributed a small amount of depth to the personality of the Wild Puffles. As Chillin43 said in his review, "By not doing any gimmicky, brand new puffle tricks, Club Penguin allowed the audience to appreciate the existence of the creatures - instead of detest it." Right now, the Wild Puffles don't seem like they're Elite Puffle worthy. But who knows if Club Penguin will start revealing their potential? A majority of the party's decorations were reused from last year. While it does make the island more vibrant and ornamental of Puffles, the decorations don't seem to serve much of a purpose. Part of the reason is because there's little interactive features in the rooms or anything to entice you to do something and roleplay. However, The Wilds were well received. It doesn't have anything too decorative but that's because it's meant to represent the wilds, however, it would have been nice if some of the rooms from the wilderness players encountered in Operation: Puffle could be visited. The Wilds has potential to be a great roleplay area, however extra features may need to be added to enhance that. Like Enb 11 pointed out, it's "...rare to see imaginative players nowadays". In the first week of the party, I saw two lovers hanging out at the campfire and penguins dressed up in wild costumes. However when I checked in for the second week of the party, there was not much socialization going on at all. Therefore, it's a good idea to add something to maintain the social and roleplay value of The Wilds. Maybe time will tell whether it will become a pookie hotspot in the future. Sasquatch is actually not the easiest to understand, and that's what makes him a brilliant character to meet. We are getting a step closer to understanding him. His dialogue when you meet him on Club Penguin has went from his grumbles and grunts in 2014 to basic English in 2015. The Rabbit Puffle and Cat Puffle emotes were a good move because they're reminiscent of emojis, enabling them to be more recognizable, and also enabling players to be more expressive. The Puffle Guides pin was well received during the party because it had a thin lining and didn't stand out too much, thus not offending the player's intelligence. The Mystery Attic has clues on Sasquatch and of other island mysteries, effectively adding to the value to revisit the room every now and then. I also found out it had a Box Portal that I didn't quite see the first time! PH, the Puffle Handler, returned to us for a two-week frenzy and had tons of stories to tell us. She was able to tell us from everything to her discovery of the Rainbow Puffle Cloud to her discovery of the wilderness – she even told us how one of her puffles sat in her backpack and ate all her Puffle O’s when she was exploring into the wilderness for the first time. The storyline here was amazing. PH also had a brand new background, something mascot’s use to have every time they appeared on the island, however, in recent times, mascots have had the same old background – good for you for starting the trend again PH! Unfortunately this party did not bring back the transformation feature where we could transform into Puffles. As consequence, the Puffle Party does not really feel like its purpose - to celebrate Puffles. As well, this detriments the roleplay value at rooms like the Lighthouse (turned into a Hospital for the party). The music at the party was not very tasteful. While the Water Party music, the music playing at the Plaza, and the music playing at the Attic was good, everything else seemed random. The Puffle Guide Uniform was one of the favorite party items from the party. The Furniture & Igloo Catalog was a hit! It was a pleasure to know that the Puffle Tree House igloo was available in a range of color schemes, something that should be available for most igloos. Also, there were a lot of good new Puffle Wild theme furniture releases, all fitting in with the party and some with an impressive amount of arrow key changes. The Penguin Style catalog came with an assortment of old and new styles, in fact, a huge assortment. However there wasn't anything really trending or standing out of the crowd that I saw penguins wearing from the new catalog. Overall, the Puffle Party 2015 is a 5.9 out of 10. The keystone that led to this grade was the effective storyline and character development of Sasquatch, the impressive new releases to the Furniture & Igloo Catalog, and even the little updates that we appreciate (e.g. emoji based emotes, smaller pins and so on). What was essential to lift this grade up was to strengthen the Gameplay features, the social aspects of the party, and most importantly, add in Puffle transformations to help players fulfill the party's purpose. This page was last modified on 23 April 2015, at 02:42.